Redesigned for 2007, Chevrolet Suburban holds a unique place in the industry, proving to be an indispensable partner for those with varied and demanding lifestyles. Despite challenging market conditions, the redesigned Suburban has continued to draw new customers, with sales up more than 10 percent during the first quarter of 2007. All models receive standard head-curtain side impact air bags (they were previously optional on some models) and the Suburban 2500 receives significant and noteworthy changes, including a fuel-saving six-speed automatic transmission, standard StabiliTrak electronic stability control system and available 17-inch aluminum wheels. Additional changes for �08 reflect customer preferences and further refine Suburban�s style. They include a change to a 40/20/40-split bench seat in LS models that provides convenient storage space in the center section; woodgrain trim added to the forward center console and brighter instrument pointers in the gauge cluster. There are also two new exterior colors: Blue Granite Metallic and Deep Ruby Metallic. Returning to Suburban is the popular Z71 Off Road appearance package. This optional package includes the Z71 Off Road suspension with high-pressure, gas-charged monotube shocks, 18-inch on/off road tires, automatic-locking differential, front recovery hooks, a durable skid plate and high-capacity air cleaner. Large, color-keyed wheel flares, an aggressive front fascia and chrome tubular assist steps, door handle centers, mirror caps and front grille inserts provide a one-of-a kind appearance. On the inside, a brushed metal look replaces the woodgrain accents for a more rugged appearance. Also included are leather-appointed bucket seats that are available in solid Ebony, Ebony with Light Titanium inserts, and Ebony with Morocco Brown inserts. Suburban also offers power articulated running boards. They blend smoothly with the vehicle�s design, but automatically move downward and outward when the doors are opened, providing a lower step-in height. Suburban�s success is derived from its capability of hauling more passengers and cargo than any other vehicle in the segment. It is based on GM�s full-size SUV architecture, which features sleek exterior styling, a sharper, more precise driving feel, more power with improved fuel economy, increased interior refinement and improved quietness. Suburban rides on a 130-inch (3,302 mm) wheelbase, which supports generous passenger and cargo capability, while enabling a smooth ride. The �08 Suburban is offered in LS, LT and LTZ models, with 2WD and 4WD, as well as 1500 and heavy-duty 2500 series. Suburban 1500 models come standard with an efficient 5.3L V-8 with Active Fuel Management� fuel-saving technology. Also available is an all-aluminum 6.0L V-8 with Active Fuel Management and variable valve timing (VVT). A 6.0L engine with an iron cylinder block is offered on 2500 models. Several available engines run on E85, a renewable fuel made of 85 percent ethyl alcohol (ethanol) and 15 percent gasoline. Suburban 1500 offers up to 8,100 pounds (3,674 kg) of towing capability (2WD models), when properly equipped; Suburban 2500 can tow up to 9,700 pounds (4,400 kg). The �08 Suburban offers security in the form of a 360-degree perimeter safety system of occupant protection and crash avoidance technologies. Standard features include roof-mounted head-curtain side air bags with rollover protection for all seating rows and front-seat safety belt pretensioners that are linked to the vehicle's sensing system to provide segment-exclusive deployment in rear-end crashes. These features are integrated into a stronger vehicle structure that is also designed for improved compatibility with other vehicles. The roof-mounted head curtain air bags include design features that provide increased rollover protection and occupant containment. These head curtain side air bags stay inflated longer than air bags developed only for side impacts, since rollover incidents can last longer. The deployment duration and other design features of the air bags combine to provide increased occupant protection and the ability to help keep occupants inside the vehicle. Sensors located at the front of the vehicle, in the side doors and within the occupant compartment provide increased and more immediate crash detection. Crash avoidance is bolstered through enhanced design and driver control dynamics, such as wider front and rear tracks, as well as more responsive suspensions � including a new coil-over-shock front suspension design and new rack-and-pinion steering. The vehicles are built on a stronger and stiffer, fully-boxed frame that contributes to enhanced crash energy management. The front frame section has been designed to optimize crush progression, resulting in improved energy absorption efficiency. The improved crush performance, enabled by hydroformed frame rails and efficient chassis component packaging, also comprehends design provisions for improved vehicle-to-vehicle compatibility in the event of a frontal impact with a smaller vehicle. All models come with the OnStar system (with a one-year Safe & Sound service plan). The system includes the General Motors Advanced Automatic Crash Notification (AACN) system, making crash data available to emergency services to potentially dispatch the appropriate life-saving personnel and equipment to crash scenes faster. All �08 Suburban LT and LTZ models feature OnStar�s Directions & Connections service, which includes Turn-By-Turn Navigation. Suburban is built on GM�s full-size SUV platform, which incorporates features such as a fully boxed frame, coil-over-shock front suspension, rack-and-pinion steering and an all-new, premium interior system that bolster the vehicle�s comfort, quality and capability. Wider front and rear tracks enhance handling and lower the center of gravity for a more confident road feel. Extensive attention to detail was paid to ensure a quiet driving experience. It centers on the stiff frame, which reduces vibrations transmitted to the passenger cabin. The strength and accuracy of the fully boxed frame also enable more precise mounting and tuning of chassis and suspension components, which also help reduce vibration. Even the tires on the large, 17-inch standard and 20-inch available wheels (1500 models) were designed to reduce noise. Also, a sleeker shape � thanks to improved aerodynamics, streamlined exterior mirrors and roof rack, more steeply raked windshield and tighter body gap tolerances � assures a quiet ride. Suburban�s quietness and smoothness is complemented by the Autoride suspension system, which is standard on LTZ. This segment-exclusive bi-state, real-time damping system provides an extremely refined ride with greatly reduced body motion. The system consists of a semi-active, two-position damping control system that responds in real time to road and driving conditions, based on body and wheel motion sensors. Suburban wears the new face of Chevrolet, with a large Chevy gold bowtie, centered on a twin-port horizontal grille. The body-colored grille surround is inset with an argent texture mesh. Fog lamps and headlamps feature jewel-like optics. The lower fascia, incorporating the front license plate holder and integrated tow hooks, is aggressively styled with a skid plate look that enhances Suburban�s rugged, off-road appearance. Suburban�s front end styling reflects its capability. It includes the fast-rake windshield; a bulging power dome hood; a prominent new fender design with integrated wheel flares; a distinctive new grille and headlamps; and a full-wrap fascia. The wraparound fascia, which eliminates the conventional bumper-to-body gap, is one of the numerous attributes that give the Suburban a more refined look. It also enhances aerodynamics. Seventeen-inch wheels and tires are standard on 1500 models, with 20-inch factory-installed wheels available (standard on LTZ). The larger wheels fill Suburban�s wheelhouses, giving the vehicle a confident stance. 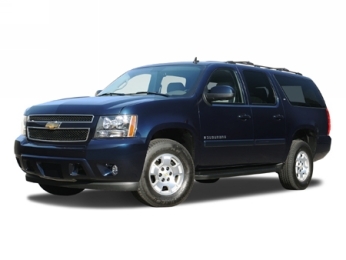 Suburban 2500 come with standard 16-inch wheels and, new for 2008, is offered with stylish 17-inch aluminum wheels. Available on LTZ models is the Chrome Appearance Package. It includes a stainless steel exhaust tip, chrome recovery hooks, and the choice of one of six 20-inch wheel designs. Suburban�s interior represents refinement, comfort, quality and convenience. The roomy interior is airy, thanks to a lower instrument panel and deep windshield that improve outward visibility. Passenger space and cargo space also are generous. Behind the first-row seats, Suburban offers 137.4 cubic feet (3,890.6 liters) of cargo room. Suburban�s seats are designed to provide more comfort, additional passenger-carrying flexibility, and easier entry/egress. Door pillar-mounted first- and second-row three-point safety belts allow slimmer seat designs (second-row, center position uses an SUV-typical three-point belt-to-seat design). Refinement is exemplified throughout Suburban�s spacious interior, creating an environment that exudes quality and precision. A two-tone color scheme is executed with soft and low-gloss materials for the instrument panel and other trim pieces. Also, there are almost no exposed metal hardware or latches, as all models feature enclosing �close outs� around the seat bottoms and doorsill trim plates. Accessibility and capability are enhanced with features that include a unique power-release fold-and-tumble second-row seat and a third-row seat that also is easily removable. Storage capability is maximized with the segment�s largest center console storage bin, a larger glove box and additional new storage compartments. Suburban features an impressive new audio/navigation lineup, which provides quality entertainment and information. A new family of CD/MP3-compatible radios leads the audio lineup, with an enhanced DVD entertainment system that includes a larger, 8-inch screen (with in-dash loading). A new touch-screen navigation radio is available and incorporates the view monitor for the available rear-camera system. Standard in Suburban 1500 models is an iron-block Vortec 5.3L V-8 with 320 horsepower (239 kW)* and 340 lb.-ft. of torque (461 Nm)*, which offers Active Fuel Management fuel-saving technology. Active Fuel Management technology seamlessly switches between eight- and four-cylinder power to save fuel. Two versions of the Vortec 5.3L Gen IV V-8 � including a 310-horsepower (231 kW)* aluminum-block version that is standard in 4WD models � are compatible with E85 ethanol-based fuel, an alternative to gasoline. The engines can run on any combination of gasoline and/or E85 fuel. Also available is an all-aluminum 6.0L V-8 with variable valve timing, as well as Active Fuel Management displacement on demand technology. The engine is rated at 366 horsepower (273 kW). * VVT helps optimize camshaft timing to improve low-rpm torque and high-rpm horsepower. The system is enabled by a unique dual-equal cam phaser � the industry�s first application of VVT on a mass-produced V-8 cam-in-block engine. The unique dual-equal phaser adjusts the camshaft timing at the same rate for both the intake and exhaust valves. A Hydra-Matic 4L70 electronically controlled four-speed automatic transmission is paired with the engine. Heavy-duty Suburban 2500 models offer a 6.0L V-8. It features an iron cylinder block and is rated at 352 horsepower (263 kW)* and 383 lb.-ft. of torque (519 Nm). * It is matched with a new, fuel-saving Hydra-Matic 6L90 six-speed automatic transmission.